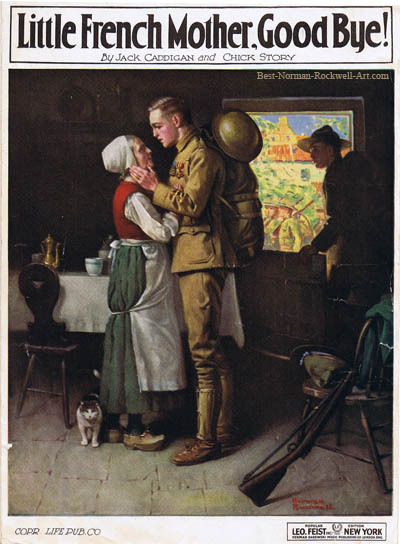 The cover of Goodbye Little French Mother was painted by Norman Rockwell and licensed from Life magazine. I thought you might want to read the words to the song that goes with the painting. The song writers, Jack Caddigan and Chick Story, also wrote Rose of No Man's Land, Salvation Lassie of Mine, In the Sweet Old Way and other less famous songs. This sheet music cover appeared after being published on the Life magazine cover with a slightly different title, Goodbye, Little French Mother. This is sung "tenderly with feeling" according to the score. And just how much we think of you." Copyright MCMXIX by Leo Feist, Feist Building, N.Y.